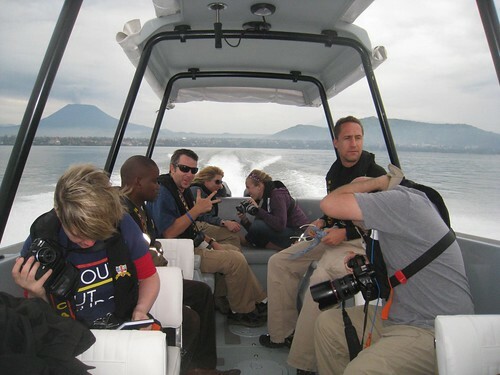 After a few nights in Gisenyi, we boarded a sleek, new speed boat to cross the length of Lake Kivu. We donned comfortable life jackets, which were a more fashion friendly black (vs. the traditional fluorescent orange), and took off. As we got some distance between us and land, an imposing, prehistoric looking volcano came into view. 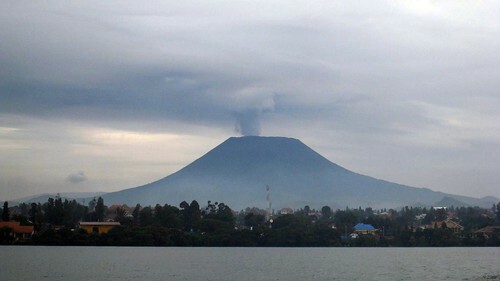 Mount Nyiragongo is an active volcano just across the Rwandan border, near the city of Goma in the Democratic Republic of Congo. Our guide informed us that in the evening, you can see red lava on it. As the volcano faded into the distance, we passed a natural gas structure which marks the future of Rwanda’s energy needs. According to a BBC News article from 2004, “the lake is holding enough unexploited energy to meet Rwanda’s needs for 200 years” though we were told they will also be exporting the gas to other African nations.